Trolli and Periscope's marketing ploy is the gift that keeps on giving. Earlier this month, Trolli launched limited edition "Tiny Hands" candy as part of an hilarious campaign for the new Deadpool 2 movie. But there’s way more to this marketing push than meets the eye. Those behind the project, which was created in partnership with agency Periscope, left a trail of clues that -- if cracked -- unlock a series of Easter eggs. Trouble is, it’s so dastardly hard that only a handful of people have figured it out (and reaped those sweet, sweet rewards). The first hint takes the form of the best title tag of all time found on launch website weirdlyawesome.com/deadpool2. It reads: "I see you checking out my metadata. Also, Paul at the NSA, please return my 27 Dresses DVD. You can just bring it to spin class next week. Thanks." It’s a nudge for you to explore the metadata by right clicking anywhere on the website and selecting "view page source." You’ll be greeted with this personalized message from Deadpool: "Oh hey. DP here. Check out my website’s giant meta description. Don’t get any thoughts, I’m not compensating for anything. Trust me. Just a bored anti-hero enjoying the sweet playground of a meta-meta-description while snacking on some Trollis. "By the way, I see you keep checking out my package. Can’t say I blame you. That’s right, I’m breaking the fourth wall AND the internet. Oh dear, look at me rambling again. I shouldn’t keep you. I’m sure you have a busy day of scrolling through reddit between important meetings in incognito browser windows. You’re probably just here to take advantage of my Easter eggs anyway. Well Easter or not, my eggs are ready. Hope you like them over-hard." You’re supposed to rearrange the jumbled words at the bottom of his message so it reads, "Unscramble this: yes, there's an Easter egg, use the hashtag." The hashtag is hidden in plain sight (black text on black background) on the website. Highlight the page to find it -- and another sassy message from Deadpool. Follow "#I’mWithMerc" -- a play on Deadpool’s nickname -- to find more Easter eggs, like this other quip in the metadata: "It’s times like these I get bummed out Blind Al." Blind Al is the character’s eccentric roommate, who’ll be making another appearance in the second movie. Apparently there’s a secret Deadpool game hidden in all this metadata as well (but good luck finding it). "From the start, we all agreed that this cross-collaboration had to be something more than a traditional license agreement. This had to be an extension of Deadpool’s own Weirdly Awesome universe. 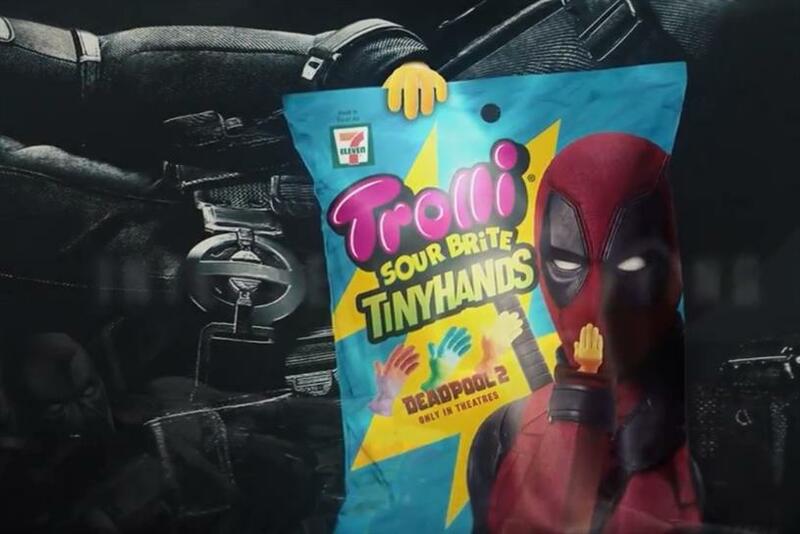 Trolli Sour Brite Tiny Hands is really pushing the boundaries, and the creative work is right in line with what fans crave from both Trolli and Deadpool," said Peter Nicholson, chief creative officer at Periscope. He added: "Tiny Hands has been a great creative challenge, because Trolli and Deadpool both have really unique voices. "No other brand partnership is positioned to do something as disruptive and edgy as this. It requires a candy company as irreverent as Trolli and a superhero as unconventional as Deadpool to create something as inventive as body parts you can eat."